You’ll find Open Range Fellowship to be a warm, welcoming family of people who love rural life, horses and cowboy culture, as well as motorcycles and the feeling of the open road. Pastor Frank teaches for a Sunday service. We gather Saturday evenings and Sunday mornings at 509 W. Lone Jack/Lee’s Summit Road (map link). Both days, our 5 to 8-piece live band and choir leads us in worship using a variety of musical styles — even some original songs! Each service includes a biblical message full of practical meaning for our daily lives. Dress code? No way! It’s completely acceptable to dress like a cowboy or cowgirl (yes, really), in your farming duds, in regular casual clothes, or wearing your biker leathers to share road patches with other area bikers. 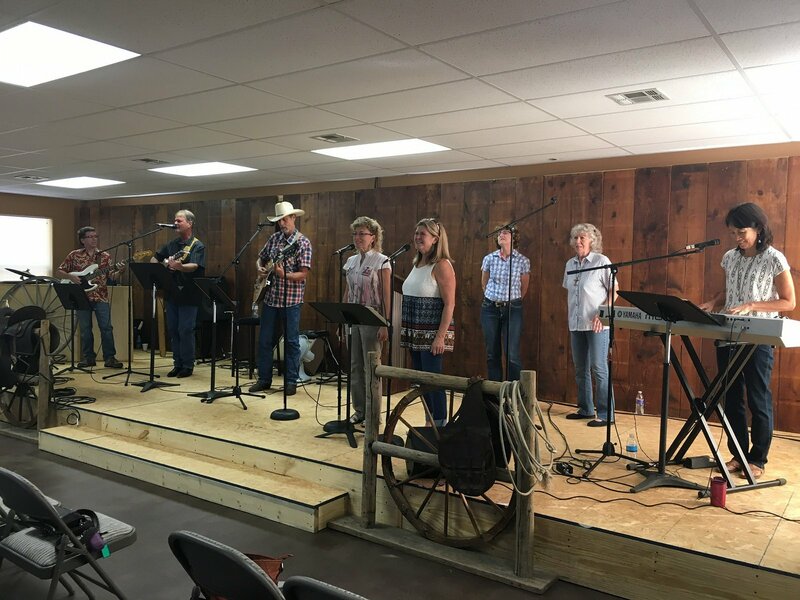 The Outsiders band performing live worship songs at the first service in the (mostly finished) new location. Youth Group starts at 4:45 pm. Then the Pastor delivers the message/topic, until around 7:00 pm. Youth Group starts at 9:00 am. Adult Bible Study with coffee and treats starts at 9:00 am in the fellowship hall. Worship music service begins at 10:00 am. Then the Pastor delivers the message/topic, until around 11:00 am. Video Archive – video recordings of pastor messages; some ORF activities, special events. Photo Albums via Flickr.com – random collections of Open Range fun.